Hello sir, first of all i would like to thank you for your contribution to the building community. Next up, i would like to ask you some questions about the build(playing chieftain). I feel a squishy, how much would the blind jewel help with the defenses? At what level should i keep my cwdt and ic if i'm not playing with abyssus just yet? Finally if you could take a looksie at my character, and give me some pointers i would be extremely grateful. blind on enemys means 50% less chance to get a hit, so its a really good defense onption. Fantastic guide and build, i prefer not to use build guides, but all the hard work you put into this one, it would be a insult not to try it. Once you pick up infernal blow this build really starts to pick up. i sinked some currency from my ranger into this build for a 6 link lore and tukohama. But I still do not understand how you manage to bring the number of Endurance charges to 9, as in your screenshots at the end of the guide. In all your videos you only have 5 charges (like mine now). So I'm in some confusion. as i wrote its from 2.6, thats a long time ago ;) meanwhile i only take up to 5 as you can see in most of my videos which are more or less up to date. Just to say im loving the build and currently sit at lvl 87 zooming through t10 maps atm. Since yesterday though, I am loosing life much faster than I can keep up with once I get my cry and charges up. Ive gone over everything but cant see what has changed, all that I can think of is the level of the gems (enduring is at 19)? The speed my life decreases is just crazy, even spamming enduring cry the whole time, i take to combine it with a life flask. Sitting at 5.7k life atm. How do you beat this hard degen? when all life reg buffs are up (warcry, golem, ...) you have 100 life reg, together with this minor node you come to 150 life reg. 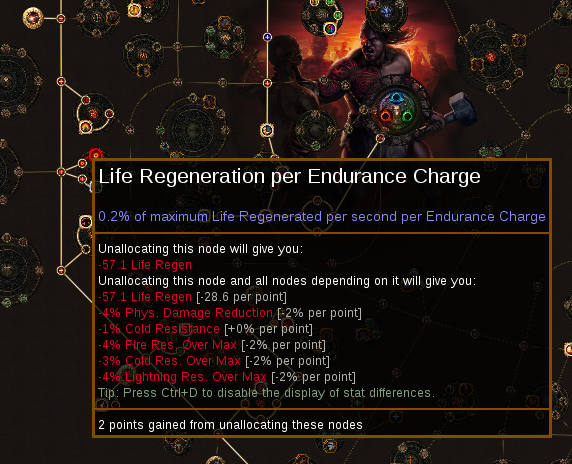 and you should farm uber labyrinth until you hit this enchantment on your boots "Regenerate 2% of Life and Mana per second if you were Hit Recently" which results in additional 120 life reg when you got hit. If I use tukohama's shield (which alread has blood magic) then which passive skill tree should I use? Blood magic or the other one? Btw. How did u get over 70% phys reduction? I have all the same items, gems and everything and have only 30% phys reduction and 40% with 3 totems (tukohama shield). Thanks for such a helpful reply, and yes I was using sorrow of the divine. I will fix it and get that additional node.